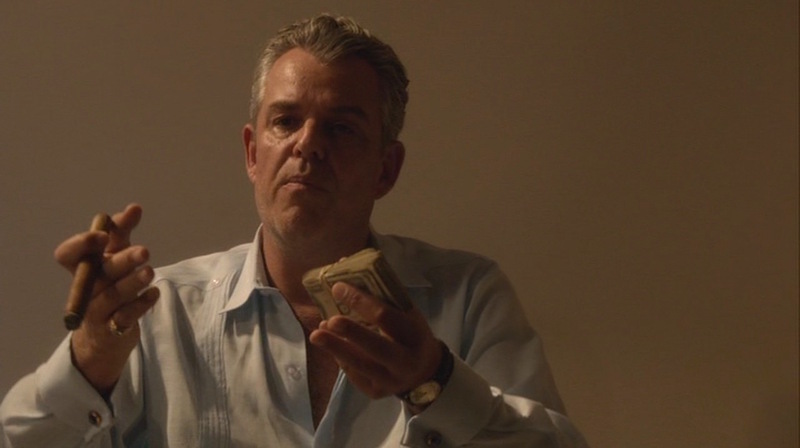 Danny Huston as Ben Diamond in “Feeding Frenzy”, episode 1.02 of Magic City (2012-2013). 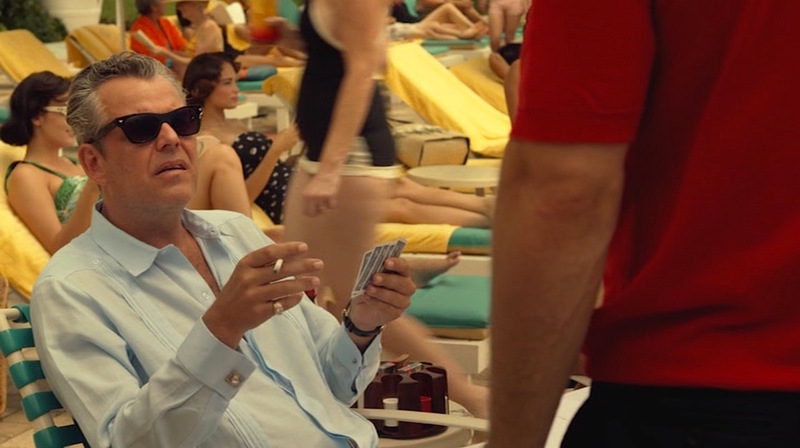 If Ike Evans is the conflicted but ultimately virtuous protagonist of Magic City, then Ben Diamond is the show’s unapologetically evil antagonist. Described in an early New York Times review as a “suntanned sociopath”, Ben the Butcher rules the beach with coldblooded brutality. I’m just going to play him for the badass that he is, because it makes him so unapologetic and somehow honest, amongst all these other characters that are morally compromised. 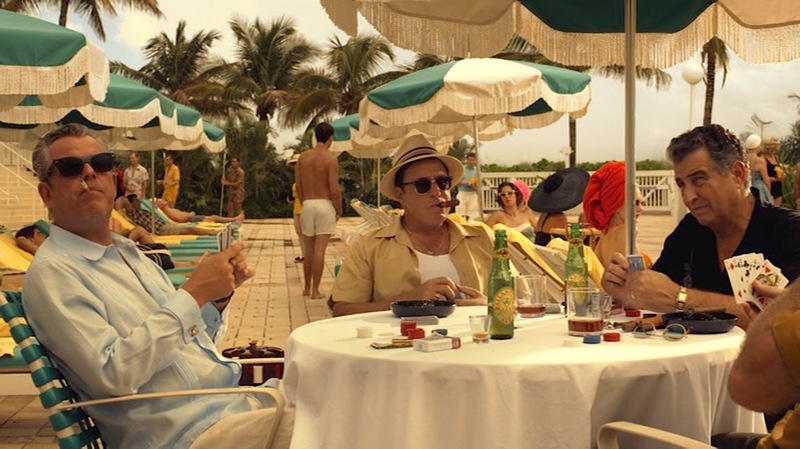 This week’s Mafia Monday installment will examine the seemingly tranquil beach-dwelling style of Ben Diamond as seen in three of the show’s sixteen episodes. 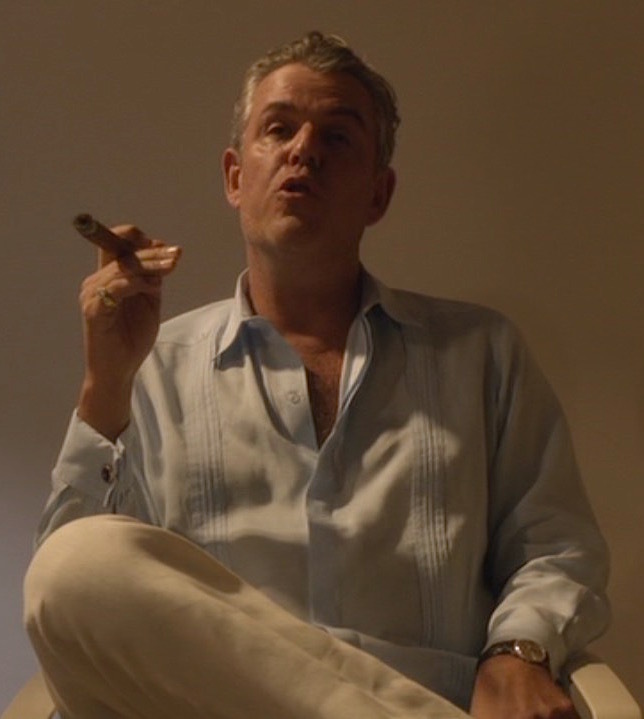 Eric Tidd, operator of the virtual Miramar Playa, owns many items from the show including this outfit and accessories worn by Danny Huston. 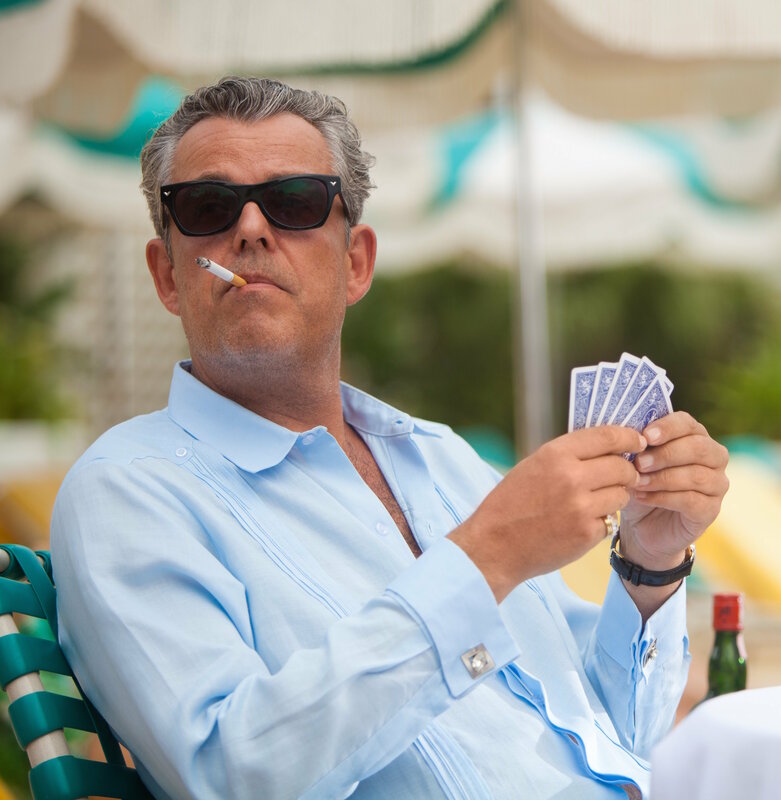 For his relaxing days spent playing poker either poolside or in his private cabana, Ben Diamond often wears a baby blue lightweight long-sleeve shirt decorated with vertical pleat strips down the front and back, making the shirt best described as a “pocketless guayabera”. A true guayabera, a traditional Caribbean-originated dress shirt with a straight bottom hem meant to be worn untucked, has patch pockets and two vertical rows of alforzas along the front and back. Ben’s shirt, which has French cuffs and lacks pockets, shares some similarities with Mexican variants of the guayabera. Ben presides over one of his many poker games in “Who’s the Horse and Who’s the Rider?” (Episode 1.07). The alforzas on Ben’s shirt consist of four thin reverse pleats in a vertical strip down each front panel of the shirt. The alforzas run from the top shoulder yoke down to the bottom yoke that runs along the straight-hemmed bottom of the shirt. Both yokes are pointed where they meet the alforzas, with a decorative button on the bottom and a smaller decorative button at the top. No matter what episode or context, Ben is rarely found without a cigar, a poker table, and his dear friend Bel Jaffe nearby. Ben’s shirt has a cutaway spread collar, always worn wide open, with clear plastic buttons down the covered front fly. The back, as confirmed by current owner Eric Tidd’s photos, has a wide single strip of pleats down the center of the back, connecting two pointed yokes that are each festooned with a decorative button. Like a guayabera, there is a split vent on the right and left sides of the shirt; each vent is fastened with three buttons. The sleeves have open gauntlets with no buttons above the double cuffs. In the first season, the French cuffs of Ben’s shirt are fastened by a pair of silver square-framed cuff links with a large diamond (hey, that’s his name!) in the center. In “Feeding Frenzy” (Episode 1.02), Ben makes it quite clear who’s in charge when talking to Stevie Evans. For the second season appearance of this shirt, Ben wears a pair of gold oval cuff links with dark blue settings. 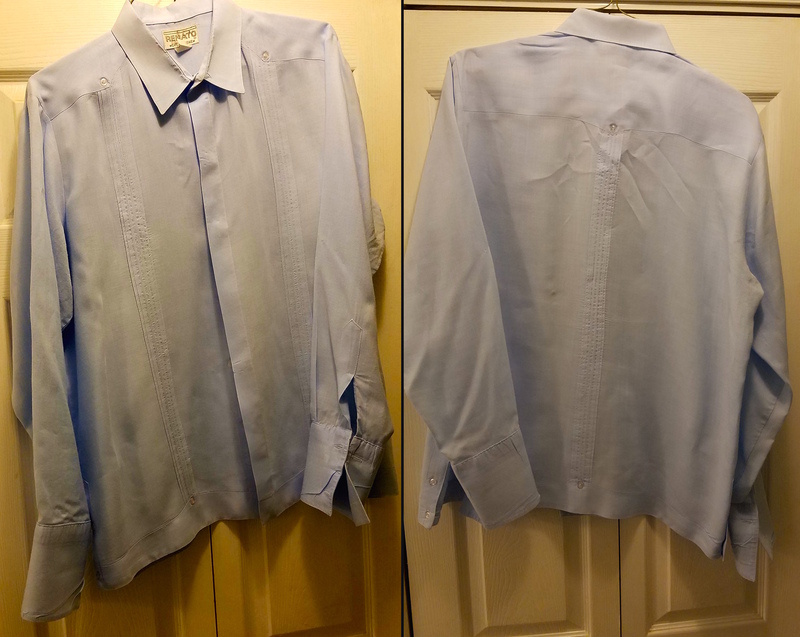 Exclusive information and images from the outfit’s current owner Eric confirms that this shirt is either all-linen or a linen/cotton blend and was made by Renato, size large. 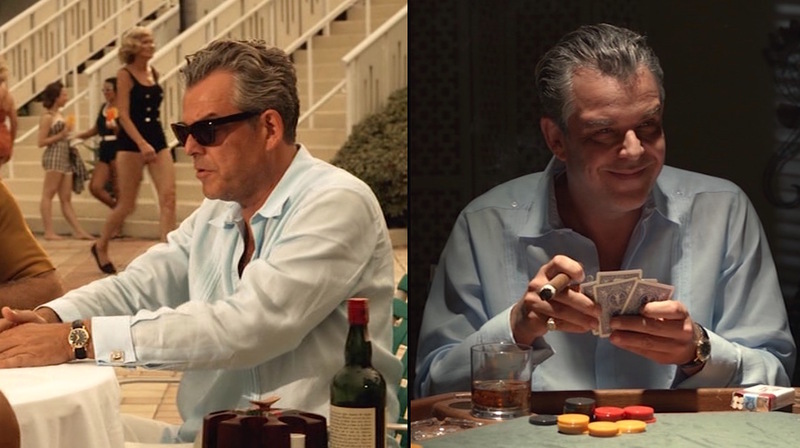 Photos of Danny Huston’s screen-worn Renato shirt courtesy of Eric J. Tidd. Some similar shirts worn by Ben can be found in an eBay auction, all from the second season episode “World in Changes”. This auction includes a dark cotton shirt and a purple linen shirt similar to this one, both by Anto, and a lighter pink genuine linen guayabera from Ramon Puig. Ben tends to wear either cream or black trousers with his guayaberas and casual shirts; in this case, it is the former. Ben’s cream flat front trousers are 100% Irish linen with plain-hemmed bottoms. Eric has confirmed that these Brooks Brothers trousers – with a size 36 waist and 32 length – have burn holes on the back left pocket. Both back pockets are jetted and each close with a single button. Ben’s trousers and shoes are best seen in this promotional image from “Feeding Frenzy” (Episode 1.02). Of course, Jessica Marais as Lily tends to take most of the attention away from anyone or anything else in the scene. The trousers break high over his shoes, a pair of black leather bicycle-toe loafers that he wears without socks. Though not seen very clearly on screen (and the distraction of a bikini-clad Lily admittedly doesn’t make it easy to focus on a pair of shoes), some very helpful info and images from Eric confirmed that these Aldo loafers are a size 44 and have a black leather strap (not a monk strap) across the vamp with a silver-toned buckle on the outside of each shoe. Now discontinued by Aldo, these appear to be a pair of their M-19261 model, still available from Amazon as of July 2016. 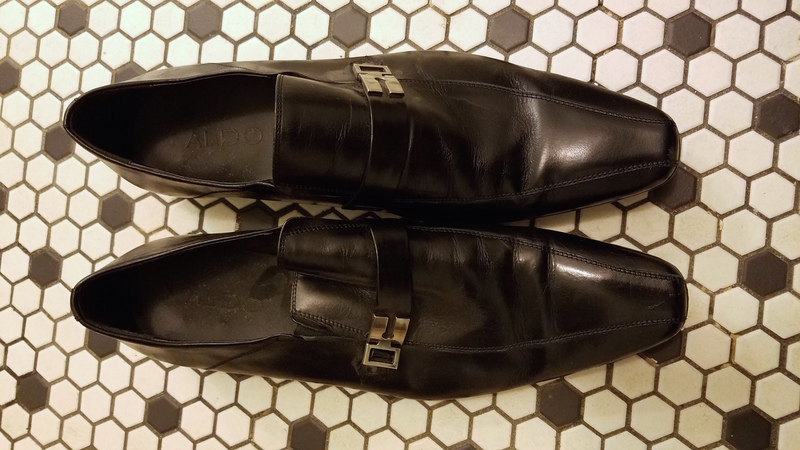 Photo of Danny Huston’s screen-worn Aldo loafers courtesy of Eric J. Tidd. Ben Diamond wears a pair of black-framed wayfarer-style sunglasses, the Victory Suntimer “Palm Beach” with dark gray lenses. The exact model number is VCS 752 in size 52/20/140, still available from the Victory Optical Collection site for $210. The gold watch that Ben Diamond wears in the first season has a small round case on a black leather strap. The black dial has twelve plain gold non-numeric markers and three gold hands. Ben’s equally adept at poker in the light (as seen in “Feeding Frenzy”) or in the dark (as seen in “Who’s the Horse and Who’s the Rider?”). Ben’s watch in the second season appears to be the somewhat larger gold Hamilton Electric watch with a silver dial, gold numeric markers, and a dark brown alligator strap. Ben’s second season accessories, here consisting of a different watch and cuff links, are seen in “Adapt or Die” (Episode 2.03). I wear a ring which is not dissimilar to Bugsy Siegel’s ring. I try to bring a certain bit of a show-off, proud – somewhat creating an empire, in that sense. There’s a sort of regal quality to him. Eric, the current owner of a set of Ben’s rings, have confirmed that extended wear has led to some of the “gold” rubbing off to reveal copper underneath. As Eric notes, this is a small price to pay for owning such incredible TV memorabilia. When not violently earning his “Butcher” moniker, Ben Diamond’s life is one of gangland luxury and leisure. 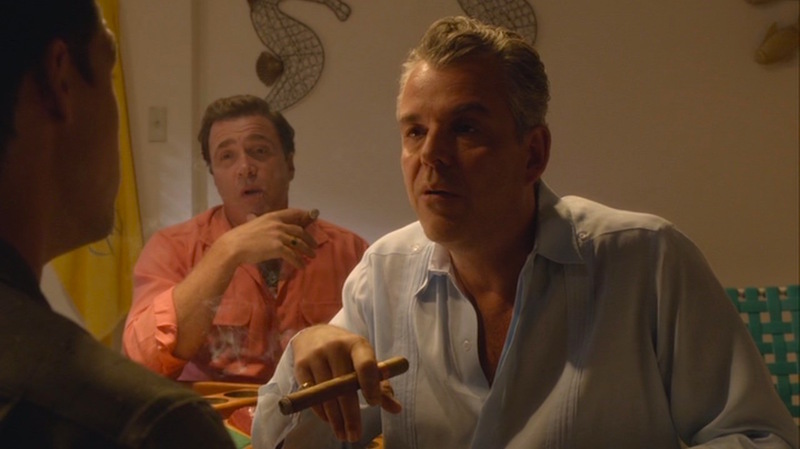 “Feeding Frenzy” (Episode 1.02) finds Ben and his mob cronies playing a few hands of poolside poker while the laidback vocals of Bobby Darin crooning “Beyond the Sea” in the background recall the iconic Goodfellas scene of imprisoned mafiosi cooking veal behind bars. During that one poker game alone, Ben is seen drinking a bottle of Ballantine Ale and a few neat pours of J&B Rare blended Scotch. His daily smokes are L&M Filter cigarettes with a gold lighter, but – like his nemesis Ike Evans – he also enjoys his Habana Partagas cigars. Ben, Bel, and pals enjoy some poolside poker and whiskey in “Feeding Frenzy” (Episode 1.02). 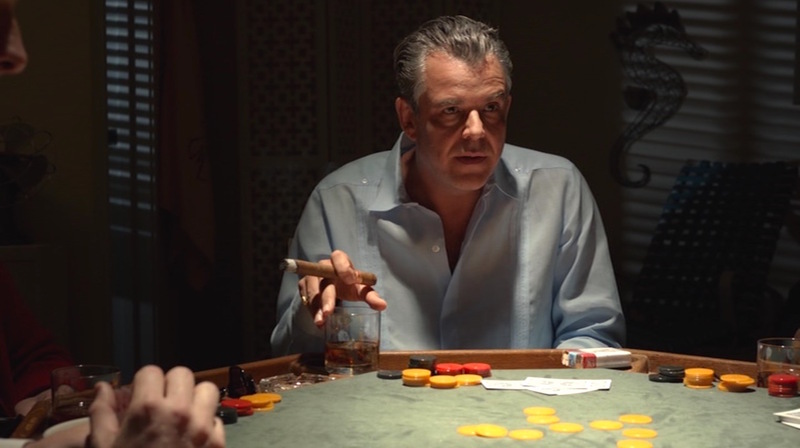 Danny Huston as Ben Diamond in “Adapt or Die”, episode 2.03 of Magic City (2012-2013). Ben the Butcher’s mix of summer-weight fabrics and name-appropriate diamonds keep him feeling comfortable but looking powerful for a warm spring day of leisure in Miami Beach. A major debt of gratitude is owed to Eric Tidd, the current owner of this outfit, who provided many one-of-a-kind images to help guide me as I put this post together. Eric also owns Ike’s cream dinner jacket, which had been featured in an earlier BAMF Style post.